Training is required for individuals that will operate aerial work platforms. Scissor lifts do not qualify technically as an Aerial Work Platform but by letter of interpretation are considered mobile scaffolding by OSHA. 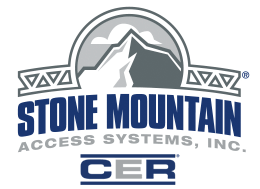 However, since scissor lifts have many of the characteristics and hazards of an aerial lift, we at Stone Mountain still recommend this training for scissor lifts as well as articulating boom aerial lifts. Students will receive a wallet card upon completion of the training. Training is good for 3 years. *Students must be observed operating the type of equipment that they will be using. Therefore the client company will need to provide the lift for the hands-on evaluation.